Turquoise has long been admired for its great beauty and brilliant colors. 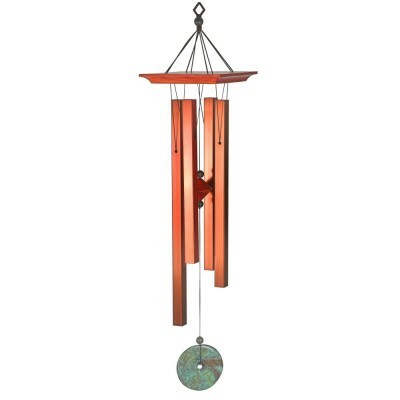 This chime is the bigger version of our best selling small turquoise chime. It's stunning good looks come from the turquoise accent stones and the handsome shape and sound of this chime. In many Native American languages, the translation for the word for turquoise is "sky-stone." This chime is tuned using the Golden Ratio, a ratio discovered by the ancient Greeks and found throughout nature. This chime measures 26" in overall length and is made from cherry finish wood, 4 square bronze anodized aluminum tubes, and faux turquoise accents.